The sports of windsurfing and kiteboarding have been around much longer than most people realize and have experienced a rapid increase in popularity in recent years. Nowadays, with safe and easy gear for beginners, locations suitable for a variety of skill levels, and excellent instructors, the sports are accessible to more than just an elite few. The Bandon area with its mild climate, beautiful scenery, and relatively reliable wind draw windsurfers and kiters of all levels. Floras Lake, just 18 miles south of Bandon near the community of Langlois, is famous for world-class windsurfing and kiteboarding for all ability levels, and the Floras Lake Windsurfing and Kiteboarding company is happy to get people geared up and ready during the warmer months. 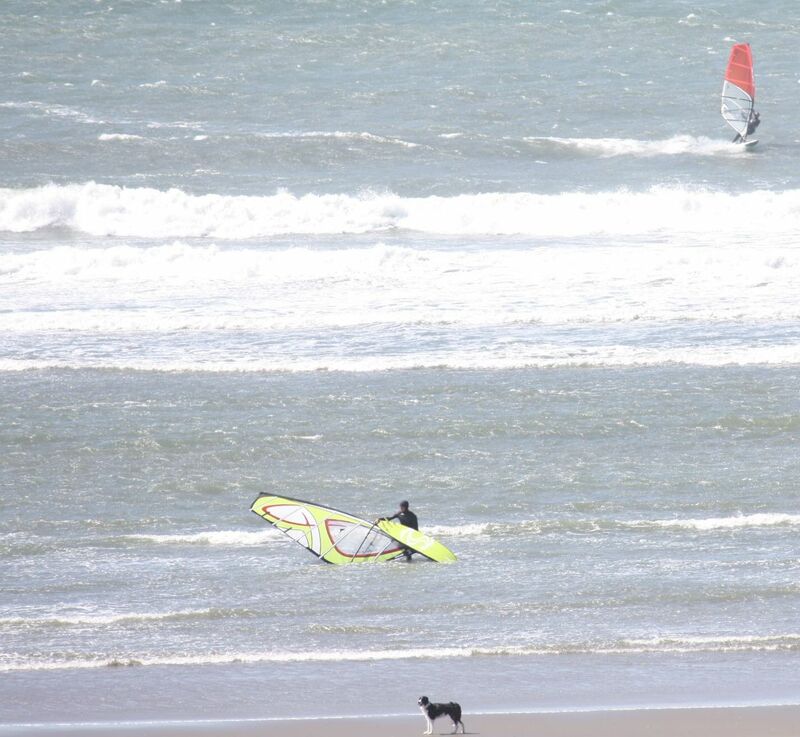 Experienced windsurfers and kiters may choose to simply rent their equipment and get themselves out on the lake. Available are longboards/shortboards + rig, boards only, and sail rigs only. Wetsuits and booties can be rented separately as well. Equipment can be rented for 1, 2 or 4+ hours. Beginners or for those of any level, from Beginners II to Advanced II, wanting to hone their skills can take lessons. Beginners need bring only a swimsuit and a towel; everything else, including a wetsuit and booties is included with equipment rental! Those bringing their own equipment save $25 on the cost of lessons. Lessons are three hours and begin at 10:00 and 1:30. Winds on Floras Lake 15-25 knots mid-day to late afternoon, so beginners will find the mornings ideal for lessons. Intermediate and advanced lessons are best in the afternoon when the winds pick up, and they prefer that these lessons are booked in advance. Floras Lake Windsurfing and Kiteboarding also rents SUPs (Stand Up Paddle), sit-on-top kayaks of various sizes, and traditional kayaks for those who prefer. For more information including contact information, prices and directions, see the Floras Lake Windsurfing and Kiteboarding website. South of Bandon by approximately 33 miles is Humbug Mountain State Park, another place well-known for windsurfing and kiteboarding. Lessons and rentals are not available, but parking and restrooms are available at the day use area. The locale is the home of the Pistol River Wave Bash in June, the place to be for those serious about their love of the sport. At the wave bash, spectators will see oceanside aerial acrobatics and some fast surfing. The Wave Bash is back for a 7th straight year after a 10 year hiatus from 2000-2010. The Pistol River, named when a militia soldier lost his pistol in the river in 1853, is a favorite for windsurfing and kiteboarders due to the strong north winds in the summer, pleasant weather, easy access, camping, and nearby Gold Beach and Brookings for hotel accommodations and supplies. There are some windsurfers and kiteboarders who brave the ocean right off the Bandon beaches, although the rocks and surf can make this dangerous. Plan well, and be sure your level of experience is appropriate for the ocean.